Bora Chhay is BGA’s managing director in Cambodia. He supports BGA clients to help them address their business problems and identifies new opportunities for them to grow and protect their business in Cambodia. 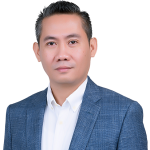 Prior to joining BGA, Bora was the corporate and regulatory affairs manager of British American Tobacco (BAT) Cambodia for five years. In this role, he helped transform the company’s government relations and corporate affairs unit into a more effective business-driven group. Despite the country’s difficult and highly-regulated macro environment, Bora played a key role in developing and executing government relations and corporate affairs strategies to shape a level playing field and regulatory environment that enabled a sustainable business growth agenda. Bora joined BAT Cambodia in 2008. His roles within the company included serving as supply planning and logistics manager and Asia-Pacific regional logistics standards and compliance manager. In these roles, he helped boost standards compliance across 19 markets in the Asia-Pacific in warehousing, transportation and security standards. Within the company, the global logistics team in the Asia-Pacific was credited with having the best practices on standards and compliance indicators. From 1997-2008, Bora held a variety of senior roles in Chevron (Cambodia) Limited, including manager of the petroleum terminal and fleet operations, product supply and trading, and business planning. While working at Chevron, he was able to save the company millions of dollars by rationalizing the logistics network by optimizing the number of terminal and fleet operations and improving product imports. Bora holds a master’s degree of science in chemical technology engineering from the Ufa State Petroleum Technological University in the Russian Federation.